The Earth has a magnetic field. Compasses line up with the magnetic field of the earth. 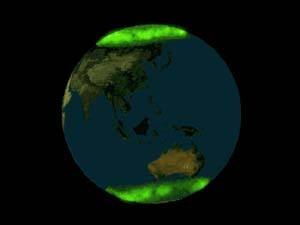 Here is a space photo of the Northern and Southern Auroras of the earth superimposed on a model of earth. When molten rocks which contain iron, cool in the presence of a magnetic field they record the magnetic field direction. We can look at the magnetic field recorded in the rocks and find out about the magnetic field of the earth in the past, the paleomagnetic field. 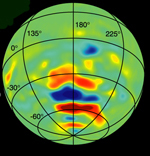 The paleomagnetic field shows that the magnetic field of the earth has flipped its direction many times. The flipping of the poles occurs after times of hundreds of thousands of years. It does not reverse on a regular basis but reverses chaotically. 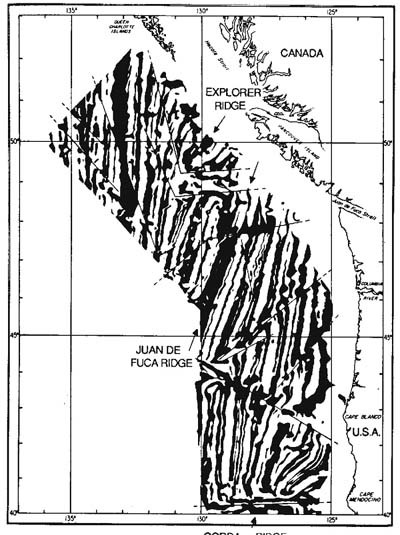 Magnetic stripes recorded in volcanic rocks underlying Pacific Ocean off the northwest coast of the U.S.
Black is south pole up, white is north pole up. The flip takes a few thousand years. The last reversal was 780,000 years ago. American Scientist Nov 1996 p 552 "The Reversal of the Earth's Magnetic Field"
The magnetic field stretches out into space around the earth, a region known as the Earth's magnetosphere. It traps charged particle from the sun into two regions known as the Van Allen radiation belts. All planets with strong magnetic fields rotate rapidly (at least once every few earth days) and also contain an electrically conducting liquid. 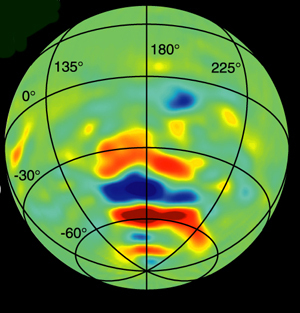 The magnetic field of Jupiter is revealed by its strong aurora. 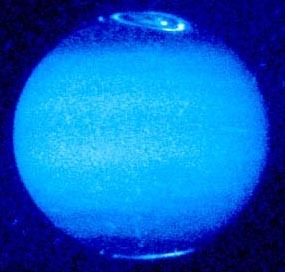 Ultraviolet image of the Auroras on Jupiter from Hubble. 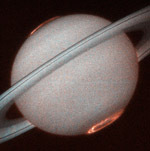 Hubble also shows the aurora on Saturn. Aurora surrounding the poles of Saturn. Mars does not have a strong dipole magnetic field and so does not have auroras circling its poles. 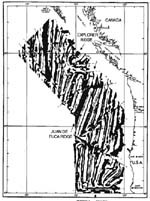 However at one time it had a strong magnetic field which was recorded in molten volcanic rocks creating stripes like those due to continental drift on earth. Red and Blue stripes on Mars record an ancient Martian magnetic field which changed its polarity. The sun has a strong magnetic field that reverses polarity every 11 years creating the sunspot cycle. Sunspots themselves have strong magnetic fields, they come in pairs with a north pole spot next to a south pole spot. The glowing solar plasma follows the field lines of sunspots creating a pattern like the one produced by sprinkling iron filings onto a simple bar magnet. Glowing plasma follows the magnetic field of sunspots on the surface of the sun.